To help your party go with a swing! Its not just the young who should celebrate their birthdays. A birthday is a time to take stock. To reflect on a year passed. A year with its own high and low points. Its successes and failures. Its moments of pleasure and happiness. Like new year its also a time for renewed vigour, best foot forward and all that! For some people birthday gifts are really important; eagerly anticipated and sometimes specifically requested. For others, especially parents, the satisfaction comes from the giver's enjoyment of the moment. Nothing beats a child's excitement and pride as the gift they have made or chosen is unwrapped and admired by Dad or Mum. Some birthdays are best celebrated quietly, perhaps a simple meal with friends and family. Other people will never miss an opportunity and make the most of this most welcome annual excuse to party! There are certain significant birthdays however that are a bit special. Its only right and proper to make a bit of fuss and bother. After all every one of these birthdays only happens once in a lifetime! 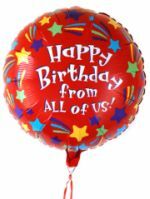 Do you have any great birthday ideas that you have seen or used? Please share them with us and and we will add them to these pages.